We were not picked up by the usual Titan Tour chauffeur transfer, as they had several Titan Tour departures that day, so they arranged for a local chauffeur company which happened to be Classical Touch to pick me up. On arrival at Heathrow, we were met by our Titan Tours guide Andrew and our agency sales manager for Titan Tours, Edwina Coppock. Andrew explained how all customers on a Titan Tour holiday will be met at the airport by uniformed Titan staff and directed to their check-in desk and their luggage taken from them. The Air Canada flight was brilliant; the staff were friendly and the in-flight entertainment had plenty of films, TV programmes, music and games to choose from for a variety of different ages. It was certainly a better experience than the Air Transat flights that I have experienced to Canada in the past. The food on board was a choice of pasta or roast chicken and they came round with the bar several times over the 9-hour flight. All in all, it was a good experience. On arrival at Vancouver airport, we had a short transfer of about 40 minutes to the Coast Coal Harbour Hotel in Vancouver City; just two blocks from the waterfront, not far from the Fairmont Pacific Rim Hotel and close to Stanley Park. The Coast Coal Harbour hotel was in a good location; in-between the main shopping area of Robson Street and historic Gas Town. The rooms were extremely large, with glass windows from the floor to ceiling all the way around. We were given a corner room, which didn’t offer the best views, but the room was very modern and comfortable. The hotel has a pool & hot tub, fitness centre, business centre, free Wi-Fi and a signature bar/restaurant called Preston’s that serves a fantastic choice for breakfast and my favourite buttermilk pancakes! Whilst in Vancouver, we also visited the Metropolitan Hotel. This was a modern hotel which I preferred to the Coast Coal Harbour hotel. It had comfortable rooms and featured the Diva restaurant, which showcased some of Vancouver’s finest cuisine and with a Chef’s table and distinguished wine cellar. En-route to Banff, the Hotel 540 is the stop over point on the Rocky Mountaineer. The hotel was adequate for our overnight stop and is conveniently situated in the small town of Kamloops near a local bar/ restaurant where we had burger, chips and beer. 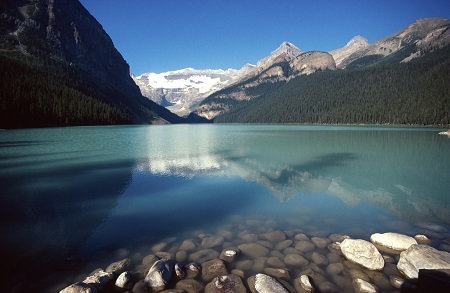 The centre of town is just a short walk along Banff Avenue from the Caribou Lodge. It is a comfortable hotel with log fires, cosy rooms and a hearty Canadian breakfast; almost giving you the feel of a log cabin. The hotel has a swimming pool, steam room and Jacuzzi, whilst guests can dine at the Keg steakhouse restaurant. Whilst in Banff, we also visit three other hotels in order to take a look around. The Delta Banff Royal Hotel was along Banff Avenue, not far from the Caribou Lodge. It was a pleasant hotel and was modern in style, but I preferred the Caribou. Banff International had large rooms and cheaper accommodation which was closer to the main town but, again, I still preferred the Caribou Lodge. The Banff Park Lodge Hotel was my favourite of all the hotel visits. This hotel is central in Banff town, with large rooms and indoor pool. It was the most modern in style but still cosy and a quality choice for people who want to be in a central location. On arrival, we had some free time to explore Vancouver city and so we looked around the shops of Robson Street and took a walk down to the Harbour, where we saw a local wedding taking place on the waterfront. We saw seaplanes and luxury yachts all moored up at the Harbour, with the backdrop of Stanley Park in the distance offering some great photo opportunities. We got to cross the world famous Capilano Suspension Bridge; managing to brave heights of 230 feet and traverse the 450-foot span across the raging waters of Capilano Canyon in north Vancouver. 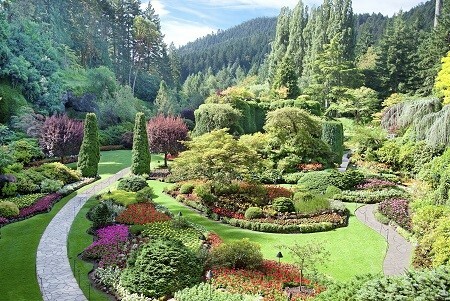 On the third day, we visited Butchart Gardens on Vancouver Island. It was such a beautiful place, where we enjoyed afternoon tea (selection of yummy cakes and tea was served) and then given a guided tour of the Gardens. Later, we had some free time to explore the city of Victoria on Vancouver Island. We checked-in at the Fairmont Pacific Rim Hotel to take the Rocky Mountaineer to Kamloops, where we were lucky to experience Silver Leaf hospitality with huge windows, plenty of room, comfortable seats and wonderful food included. Drinks, however, have to be bought separately. Our luggage travelled by coach to Kamloops. However, if you are in the Red Leaf section you will need to pack an overnight bag for your stay in Kamloops and your luggage will go straight to your final destination. It was a wonderfully relaxing scenic journey, with commentary from the knowledgeable Rocky Mountaineer staff throughout. We joined the Rocky Mountaineer again but this time we got to experience the magnificent Gold Leaf area. This was a wonderful experience and all food and soft/alcoholic drinks were included. It is in a separate carriage to everything else; upstairs with large comfortable seats and tables with a viewing platform to take photos. The carriage has windows from the ceiling to the sides of the and downstairs is the dining room where we had breakfast and a three-course lunch. We enjoyed a stunning glacier adventure excursion in Banff, which allowed us to explore two national parks, the beautiful Lake Louise and the Columbia Icefield, where we ventured on the Ice Explorer to the massive Athabasca Glacier. We caught a glimpse of a black bear on our journey back to Banff. On our last day in Canada, we went on a tour of including a ride on the gondola to Sulphur Mountain, where there was snow at the top. I felt as though I had gone back to winter; it was really strange. We also saw some elk and took some scenic photos of Banff from the viewing points. The Rocky Mountaineer was a huge highlight and my favourite part of the journey was from Kamloops to Banff, as this is where you enter the Rockies. The scenery was spectacular and the Gold Leaf service was a fantastic experience. I also enjoyed the Capilano Bridge in Vancouver and I would have loved to have spent more time on Vancouver Island. All the scenery was breath-taking and you could see that Canada is such a beautiful country. The best time to see bears is between May and September, and we were lucky enough to see 4 of them in the Rockies. This was a definite highlight for me. 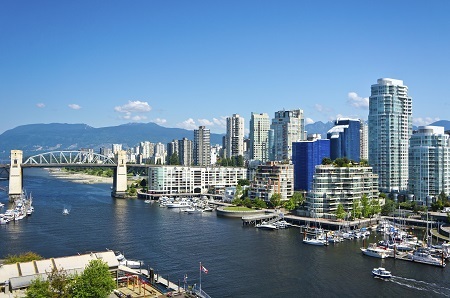 The educational itinerary was built into 7 days so we were able to experience Vancouver, The Rocky Mountaineer and Banff, but a trip like this would usually be a 10 day/ 2 week holiday. I felt we were a little rushed at times and it was a whistle stop tour, but this is was a fantastic taster and I will certainly go back. I cannot complain about anything, as Titan showed us all the highlights of Vancouver and Banff and this trip of a lifetime included so much. One last thing to remember is that it is still quite chilly in spring and there is a lot of snow at the top of the mountains in Vancouver and Banff, so wrap up warm whenever you can. I would certainly recommend a Titan holiday for older travellers as it is so suited to those who like to be looked after and escorted throughout the various parts of the holiday. You will be looked after from beginning to end, and there is so much included in the tour price. I wouldn’t recommend this kind of trip to customers who enjoy a bit of independence, as this is a full-on escorted tour. It was something I had not experienced before and we all felt that younger holidaymakers may like to have a bit more freedom. However, Canada is for people of all ages and so I wouldn’t hesitate to recommend the country to anyone who loves exploring new places, getting to see some stunning views and exotic wildlife and taking part in some amazing new experiences. We can help you arrange a similar tour to the one that Vicki went on, which would make the perfect family holiday. Just speak to one of our knowledgeable experts in store or fill out an enquiry form online. We can also provide you with travel insurance, rail transfers to the airport and access to various airport lounges, thanks to our partnership with Holiday Extras.